Roundtable on "Building Just and Peaceful Societies: UNESCO’s contribution to a Culture of Prevention"
Through intergenerational and intercultural dialogue, participants will assess efforts undertaken and opportunities to strengthen UNESCO’s work to prevent conflict and assist in the consolidation of just and peaceful societies. 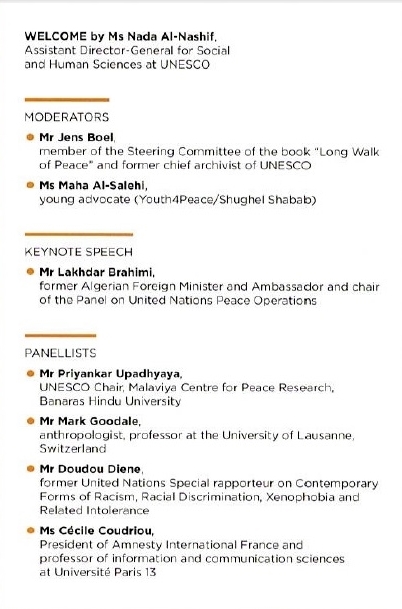 The event will bring together leading experts from academia, civil society and international organizations and present UNESCO’s newly released book “Long Walk of Peace: Towards a Culture of Prevention”. Published by UNESCO in May 2018, this book includes an analysis and overview of the conceptual and strategic development of the UN’s peace work, written by leading peace researchers from India and Norway. The study is also based on accounts by 32 different UN entities on their contributions to the UN’s work for peace, accomplishments, challenges, lessons learnt and perspectives for the future. The research study is a major contribution to the implementation of the International Decade for the Rapprochement of Cultures (2013-2022) for which UNESCO has been designated as the coordinating lead agency by the United Nations General Assembly. The lessons of the book “Long Walk of Peace” as well as the celebration of the International Day of Peace in 2018, under the theme ‘The Right to Peace - The Universal Declaration of Human Rights at 70’, offer an opportunity to reassess UNESCO’s efforts to build peaceful and sustainable societies based on the principles of human dignity and fundamental freedoms. Mr Lakhdar Brahimi, former Algerian Foreign Minister and Ambassador and chair of the Panel on United Nations Peace Operations which produced the influential Brahimi Report (2000). He has done extensive work in the field of conflict resolution, peacemaking and peacekeeping and has served the United Nations as a special advisor to the Secretary-General and as the UNs representative in all regions of the world, including Haiti, South Africa, Afghanistan, Iraq and Syria. He is currently a Visiting Fellow at the London School of Economics and a governing board member of the Stockholm International Peace Research Institute (SIPRI). Professor Priyankar Upadhyaya, UNESCO Chair, Malaviya Centre for Peace Research, Banaras Hindu University will present and analyse the interaction between peace and human rights on the background of the above-mentioned new UN study: "Long Walk of Peace. Towards a Culture of Prevention". Professor Mark Goodale, anthropologist, professor at the University of Lausanne, Switzerland, author of the just published: "Letters to the Contrary: A Curated History of the UNESCO Human Rights Survey", will present his study of UNESCO’s post-War survey on the philosophical bases of human rights and discuss the ongoing life of human rights in the XXI century. Mr Doudou Diene, former United Nations Special rapporteur on Contemporary Forms of Racism, Racial Discrimination, Xenophobia and Related Intolerance, will debate - as a seasoned voice for human rights in the United Nations system - the challenges for consolidating a culture of prevention and sustainable peace. Ms Cécile Coudriou, President of Amnesty International France and a professor in information and communication sciences at Université Paris 13. Ms Coudriou will discuss civil society perspectives on the importance of human rights for the construction of peaceful societies, in particular with regard to the fight against impunity.